The Petal Mirror is the result of your asking for more mirrors for the smaller beaks in your life. There is a Parrolink on top for easy hanging, a mirror for your bird to enjoy (his/her buddy? 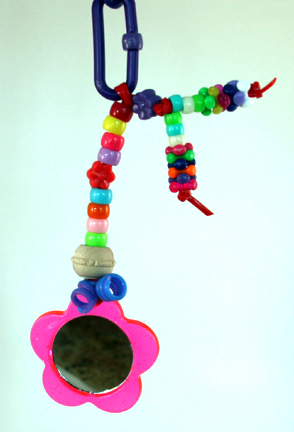 ), a wooden bead for chewing fun, some pony beads and a couple tails or more beak pleasing bead popping fun plus some squiggles (they're like plastic curly laces) just for fun! All strung on a light weight, plastic cord. Perfect for those little tweets in your house!